Patients often come into our cosmetic dentistry practice and complain about ‘a toothache the size of San Diego’. I understand this kind of pain, and realize that when you describe it like that, it really hurts. I can help. 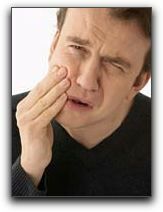 Toothache pain for anyone in San Diego can be unbearable. At the very least, toothache pain can cause you to avoid eating certain foods, certain temperatures, and even talking. Severe toothache pain can be downright debilitating, forcing cosmetic and sedation dentistry patients to go to extreme measures to alleviate the pain. Around San Diego, the most common causes of a toothache include tooth infection, decay, injury, and loss of a tooth. Tooth pain can also occur after a tooth has been extracted, or after an oral surgery involving anything from a tooth or your jawbone. I can help you better understand the source of your toothache pain, and in most cases can provide a nearly immediate remedy. In severe cases, we are equipped to council you on a variety of resolutions. When we check your mouth, we will also give you an oral cancer exam to make sure your smile is healthy. Of course, the best way to avoid toothache pain is to visit your San Diego dentist often, and to care properly for your teeth including the regular regimen of brushing and flossing.